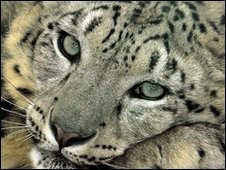 A pair of snow leopards and two bear cubs were among the exotic animals found in the private zoo of ousted Kyrgyzstan President Kurmanbek Bakiyev. A golden eagle, two falcons, four African peacocks and Indian ducks were also found in the zoo at the family home in the southern Jalalabad region. Investigators found the collection when they raided the estate after Mr Bakiyev fled the country. He is now in Belarus. He has been charged in absentia with organising mass killings. Mr Bakiyev was ousted in protests on 7 April in which more than 80 people died. The interim government says his administration ordered troops to open fire on protesters. It plans to seek Mr Bakiyev's extradition from Belarus to face trial. The former president also kept an African ostrich and Austrian white and black swans in his private menagerie, investigators said. "The prosecutors are considering measures to evacuate those animals for their protection," the prosecutor general's office said.